Thailand is a Southeast Asian country. It’s known for tropical beaches, opulent royal palaces, ancient ruins and ornate temples displaying figures of Buddha. Arrive at Bangkok. On arrival, meet our representative and get transferred to Pattaya. Having checked into the hotel, Refresh and relax. The day is free for you to relax & refresh.. In the evening, we would take you to see the World Famous Alcazar Cabaret Show and be entertained with music, song and dance. For almost 20 years, the show has been delighting audiences from around the world with the magic of state of the art computerized sound and lighting system and talented entertainers Stay Overnight at hotel. After BREAKFAST, we would take you to the exotic Coral Island by speedboat. On the way to Coral Island, halt at a place in the sea to enjoy para gliding, para sailing or surfing on the sea. Thereafter, you would be transferred to the Coral Island by a glass bottomed boat, where you can see the beautiful corals under the sea, through the glass bottomed boat. Enjoy the beautiful beaches of Koh Larn, Idyllic Island west of Pattaya. Spend the day with swimming, snorkelling and sunbathing which are the activities of this island. Transfer Back to Pattaya in the afternoon, by Speed Boat. Enjoy the Indian LUNCH. Return back to hotel. Stay Overnight at hotel. After BREAKFAST, we would transfer you to Bangkok. Reach Bangkok, Check into hotel. 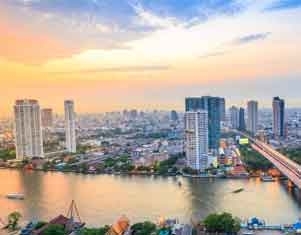 After refreshment proceed for half day tour and visit Bangkok’s most distinguished Temples, The Wat Trimitr with its 900 year old solid gold Buddha and Bangkok’s oldest temple of reclining Buddha. Thereafter, visit the beautiful Gems Factory, where you can see how diamonds, sapphires, Rubys, emerald stones are converted into ornaments from raw metals and Return Hotel. Stay Overnight at hotel. After BREAKFAST, the while day is free to explore Bangkok and do shopping. Alternatively you may book some optional tours and explore the cultural side of Thailand. Stay Overnight at hotel. After BREAKFAST, the entire day is free for you. In the evening around 6.30pm, we will transfer you to airport for your return journey. Regret as you leave the place & return home with happy memories. · 02 Nights accommodation in Pattaya. · 02 Nights accommodation in Bangkok. · Alcazar Show in Pattaya. · Coral Island with Indian LUNCH in Pattaya. · Half Day City & Temple Tour in Bangkok. · Sightseeing to Gems Gallery in Bangkok. · All sightseeing mentioned in the itinerary is included. Overseas Insurance is not included. Requested separately during the course of the tour for any reason.